No time to read? No problem! We'll email you a link to this article so you can read it later. I’m not a fan of tactics. I talk and write a lot about that. Now, don’t get me wrong — we deploy tactics that work all day long. But tactics work best in the context of a well formulated, overriding strategy. And strategies are all about how you’re going to get to a destination. Tactics are often what brings prospective clients into our orbit. When companies feel like they’re underperforming — usually expressed as a lack of leads, low conversion rates and less than stellar customer lifetime values — they often go on the hunt for a tactic or a service. They’re looking for something. Some magic elixir. If they could just get that thing, that trick that eludes them, it might jump-start greater online performance. Unfortunately, agencies feel compelled to quote on tactics and a la carte services. There’s a better way to go about this. And there’s so much upside to our approach for all involved that it’s a bit of a no-brainer. First, let’s take a quick look at the status quo. As the owner or marketer for an established but underperforming firm, a few agencies are on your radar. You’re hearing a lot about automation. It sure sounds a lot easier than this other stuff you’ve been doing and you don’t have it. You may be at the stage where you have created a formal RFP outlining exactly what you want and maybe even specifying things like the tools the successful agency will use, the quantity of content to be produced, etc. A less formal but common approach is to have a discussion leading to meetings where you articulate what you’re looking for and culminating in you requesting a proposal be drafted. Here’s the inside scoop on this: proposals are expensive guessing games. As agencies, we put on our Amazing Carnac hats and attempt to divine what it is you want, how we will do it, what your budget might be and put a dollar value on something that is at best hazy in terms of scope … not to mention value. Proposals are time-consuming and because they are unpaid, agencies are likely to rush through them. And because the agency lacks most of the information they need, they could be suggesting and quoting on the wrong solution altogether. And that RFP? It’s quite possible that behind the scenes the agency is saying “I wouldn’t do it this way … but that’s what they want, so put a price on it.” Yikes. It’s a precarious, wrong-headed start to an important relationship. You’ve been reading some of our thought leadership, we’re on your radar and you reach out to us about having a conversation. As my business mentor, Blair Enns preaches, “we will replace presentations with conversations.” Better outcomes begin with better conversations. Honest and direct conversations get both parties where they’re going more efficiently. Whether it leads to “next steps” or goodbye, either way, a decision is made. Next steps should be a paid diagnostic. Where the client pays the agency to analyze their business, part with their expert assessment and determine a path forward based on that assessment. We call this process Game Planning. Think of it as our first project together. At Quarterback it’s a structured process whereby we lead you and your team through a Discovery Session, we assess and score your current digital marketing against a set of criteria in each area of our Quarterback Framework and we do some digging into what your competitors are doing and what your ideal customers are saying out there in the wild. It provides both a diagnosis, often exposing issues you don’t know you have and provides the path forward, your Game Plan. It explains the destination, so you and your team get the strategy and set of priorities that become the roadmap that leads there. It brings all elements of your marketing out of their silos so you allocate your resources efficiently and in concert with one another. It de-risks your investment by allowing you to know if you’re going to like working the agency — without committing to a multi-month engagement. You get the kind of result a typical proposal could never produce — one that doesn’t kick everything off on false pretenses. You get a quote that reflects what actually needs to get done and that could be lower than the typical proposal where agencies buffer a lack of information with financial padding. For example, a project may be a better alternative to an ongoing engagement. It removes the creative shackles that come with RFPs and allows the agency to introduce ideas you didn’t know were possible. It allows firms like ours to make the value case based on real metrics like subscribers, conversion rates, sales-ready-leads or average sale value and lifetime value to justify your investment in us. You get a solution designed for the real problem. In case that little voice in your head is telling you “we don’t need to this” or “we know what we need” or “we have this information” or “we don’t have time for this — we need to get implementing”, I hear you. But here’s why we’re going to let your competitors hire agencies that old way I describe above, and you’re going to do it differently this time. Left to our own devices we will skip the pivotal work that leads to things that are so strongly correlated with success and that pay dividends over and over and over again. Time spent to set you on the right course will make all subsequent work more efficient and impactful. It’s the old slow down to go faster axiom. We’re going to look at your goals and your digital marketing from outside your bubble. We’re going to evaluate it through the lens of our expertise and experience and from the perspective of our framework. This is where the gold lies. Okay, so we’re four weeks down the road on our Game Planning Diagnostic. And now you have your Game Plan in hand. 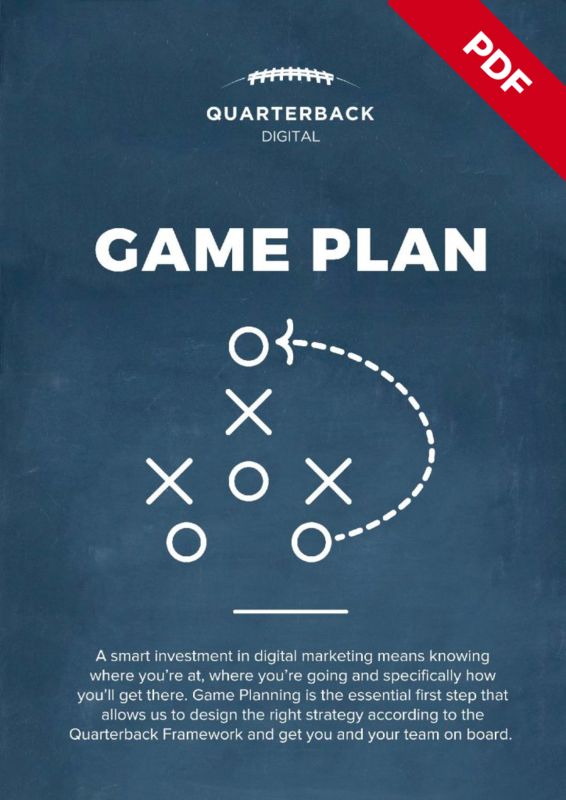 We’ve diagnosed the gaps in your current digital marketing and exposed opportunities. We’ve documented our solution in the form of a month-by-month set of priorities based on your scores. So what’s next? You have options. If you have the skills and manpower in-house, take the detailed plan and run with it. It’s yours to execute on. Now that you’ve got a well researched, carefully considered, expert opinion you’re ready to hire a digital marketing team. One of the great benefits of Game Planning is that it’s its own project. It’s a product that has value. You have an expert opinion and you are not required to make a multi-month commitment to get here. You are a free agent. It makes sense: if you’re happy with the team that produced your Game Plan and you don’t have a team of specialists in-house or at least not a full team, hiring your Game Planning team to help you execute is a no-brainer. They’re able to hit the ground running, they know what they’re looking for in terms of specialist team members, they remove the risk of hiring for an in-house team and they make sure the strategy is realized. RFPs and proposals are risky for agencies. They’re expensive to produce, often include a lot of boilerplate and are the agency’s best guess at what you want (not need) and your estimated budget. Game Planning, on the other hand, is a first project with an agency you’re interested in working with. Test drive an agency before a big commitment of time and money. Provide the agency the time they need to really analyze the problem and design the right solution. See your marketing from outside your bubble and against a framework that brings your marketing together. Get a value case for an engagement — not one based on creative excitement. Move away from RFPs and assumptions that neuter innovation and creativity from prospective partners. Build buy-in resulting in better relationships and happier, more productive teams. Break the mold. Try it. It’s a win-win. Our Game Plan shows you what to do and how to do it. FASTER. We'll use your email to send you this and other useful information about digital marketing. We hate spam too so we'll never share your email. Unsubscribe anytime. Our team is made up of seasoned experts in various fields from paid acquisition, analytics, conversion rate optimization, web design, development, copywriting and many others.